I have a lot going on this month. I thought that March was going to be quiet because I wasn’t traveling at all, but, of course, that didn’t last long. I’ve been refereeing rugby every chance I get, with the intention of getting to a good place early on so that I can climb the ranks leading into the busy summer and fall seasons. For example, I write this on Wednesday night in the first week of March. In January, I had two rugby refereeing events. In February, I spent 10 days in Georgia, including two weekends, but still managed to get three rugby opportunities on the 21st, 27th, and 28th. For March, though, I’ve got the 3rd, 5th, 6th, 12, 19, and 26th scheduled, with more that could be added on! Busy, to say the least. I was submitting an idea to a pitch competition for the chance to win some prize money (to help pay off some debt maybe?). That was pretty cool. I’ve been working on the proposal for a couple of weeks, but I’ve decided that I don’t want to submit it and instead I’m going to try to build it! That’s going to give me the chance to work on my development skills with a specific goal in mind. I’m working through Regina’s Blog Business Plan for Burke Does and making some adjustments to the site to make the reading experience better. I want to write better, more-focused posts on personal finance, fitness, and food with some fun and fashion along the way. I promised myself I’d get more involved with Junior League and the local Baltimore community. Events are usually on weeknights, but I’m so tired after work that finding the energy to go can be hard. I spend my weekends mostly doing rugby, so I have to do the weeknight Junior League options, but I’m so tired. Like, so so so tired. The same is true for my KKG Alumnae Association. Not to mention that doing those things and being social generally is expensive. I’m trying to pay down debt, and I’m really committed to it, but going to the events, even just book club, can be at least an $8-$10 night. I’ve been trying to capitalize on free networking opportunities, but it can be so hard. I’ve been trying to take a night coding class for weeks, but I keep failing when everything gets in the way and when I come home from work super tired. I’m so disappointed in myself for repeatedly failing at this. I’ve always considered myself a self-starter but for some reason I can’t get past this and it’s so hard. As if it wasn’t all difficult enough, balancing a long-distance relationship hasn’t been easy. Don’t get me wrong we’re doing fine and that’s not the issue, but Casey is in the field every other week. Plus every 6-8 weeks, I pack up to live out of a suitcase there with him for 2 weeks at a time. Basically, I’m tired. And it’s okay to be tired. What I’m not really willing to keep doing is pretending that I have it all together all the time. There’s so much pressure to live a picture perfect life and to make it seem like I have everything together all the time. I’ve been so swamped that I haven’t really event given myself permission to go get a pedicure, one of my top feel-good indulgences, even though I’ve been telling myself to for months, plural. If you’re so stressed, why don’t you cut back? Frankly, I find the things I’m doing really fulfilling, even though they are stressful. A couple of weeks ago I spent my Friday night and all day Saturday at a coding workshop with my coworkers and then all of Sunday at rugby, but that weekend was so fulfilling for me because I spent the entire weekend learning which is exactly what I love to do! I have been brainstorming ways to make what I’m doing easier. I’m revamping my morning routine for optimized self-care while balancing morning blogging responsibilities. I’m thinking about my larger weekly routine to see what can be more efficiently. I’ve also decided to take a slightly different route this March with Burke Does. I’ve decided I want to keep writing because I like it and I find it fulfilling. After all, that is the point for this little space of mine on the web. I blog first and foremost because I enjoy putting words to paper (fingers to keyboard in the digital age). 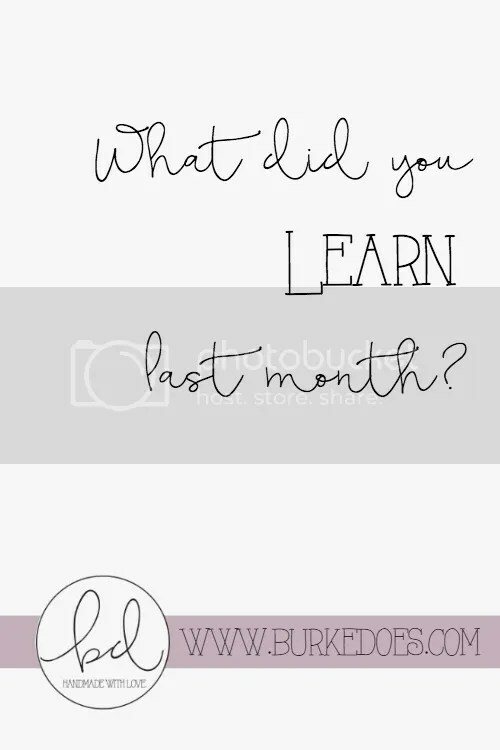 This month, thus, I’ve decided to try following these March Journaling Prompts from Hello Neverland as my blogging prompts for the month. I don’t normally blog on weekends, so you shouldn’t expect 31 posts this month. I have a couple of my regular monthly posts that I’ll plan on putting out- What Would You Do and Reading Roundup, to name a few- and a couple of really exciting guest posts that I’m publishing elsewhere and guest posts that will be coming here from our blogger friends. For the most part, though, I really look forward to responding to Kenzie’s prompts! Thanks to Macy for suggesting them! I shared in the Reading Roundup what I read last month. Reading, though, is just one way that I’m constantly learning. The biggest theme of what I learned in February, though, was focused on personal finance. I learned about the pervasiveness and the burden of debt to Americans. Despite having committed to my debt repayment earlier, a new fire was lit under me when I learned more about interest rates and brainstormed ways to save money in my debt repayments. I also learned to appreciate so many little things in my relationship. My trip to Georgia for Valentine’s Day was a last-minute booking at the end of which we said goodbye for a 52-day separation. There are 36 days left according to my Doing Time App, but it feels like it’s been forever. I miss really simple things like napping post-Church and Sunday brunch on the couch when we said we were going to watch a movie. I’ve always known these things, but every visit together makes it that much harder to say goodbye, and every stretch apart makes me never want to have to do it again.